I just came back from a trip where I was eating like I had just returned from boot camp. Of course, I’m not a young chick anymore, so a common thing happened. I gained weight. So now I’m on a diet. I have my simple trick to help me maintain my weight. Wait, why would little me have to maintain my weight, you might ask? Well, I’m a woman who owns quite a bit of clothing, just like most other women my age, except that my clothes are a special size. For a woman who needs alterations done to fit in size petite zero, and still wants to look fashionable, then clothing items are treasures you cannot lose to the excess fat on your body. So, my simple trick is weigh myself daily at the same time (in the morning right after, errrr…the classic elimination of yesterday’s foods in my body). This way I know right away if my weight is over the limit where I can fit in my clothes. If so, what do I do? Eat less and exercise more. Simple, right? I am someone who can’t do weird diet programs such as low-carb, no-carb, low-fat, sugar-free, Paleo, South Beach, etc… I love to eat too much. I can’t sacrifice, because I want full flavors. I only live once, you know. I have to live like I really mean it, especially with food. If I gain 2 or 3 pounds, it might sound like too little to care about, but it’s equal to about 5 or 6 pounds in regular size 2 to size 6 women or 10 pounds or more in most men (who normally claim that they can poop that out the next day! Sorry I never had a 2 lb. poop in my life.) After this trip, I will just eat more vegetables, smaller portions, increase the number of meals, and a eat very, very light dinner, and exercise more for a week or two. Then I should be back to my normal weight and get to eat whatever I want again (with regular exercise, of course). I also do not sacrifice the taste for anything. If the food doesn’t taste good, I don’t eat it. People around me usually don’t see me munching on just a stick of celery or carrots. I am not in any way, shape or form a rabbit in disguise. I also don’t cut down on the number of meals. I actually increase it but lessen the portion and lower the amount of calories in each meal by adding more fiber. During my “diet” time, Som Tam, or spicy raw green papaya salad, finds its way onto my dinner table quite often. It’s really light, vegetables with some protein and very little fat, but full of flavor. Also, Som Tam, the Thai variation, was listed at number 46 on “World’s 50 best foods” compiled by CNN Travel in 2011. Am I raising your curiosity yet? What’s Som Tam? 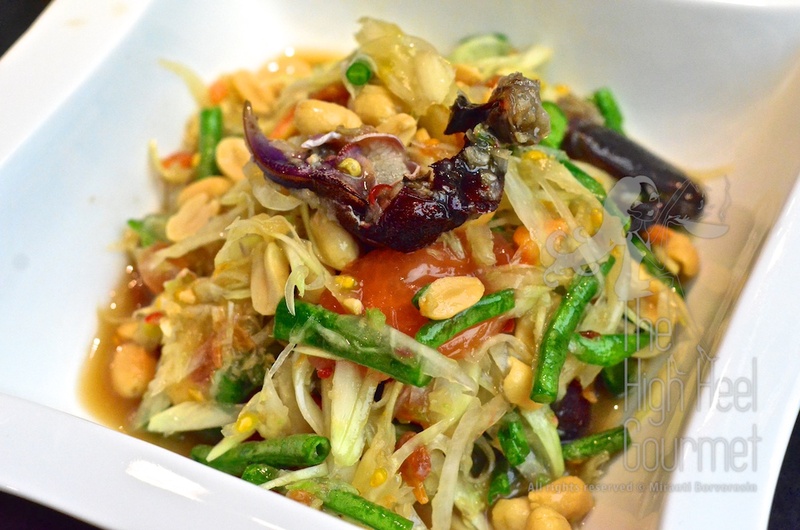 It’s a North Eastern (Issan) Thai dish made with raw green papaya, garlic, tomatoes, yardlong beans or Chinese long beans , fish sauce, lime juice, coconut palm sugar, peanuts and bird’s eye chilies. 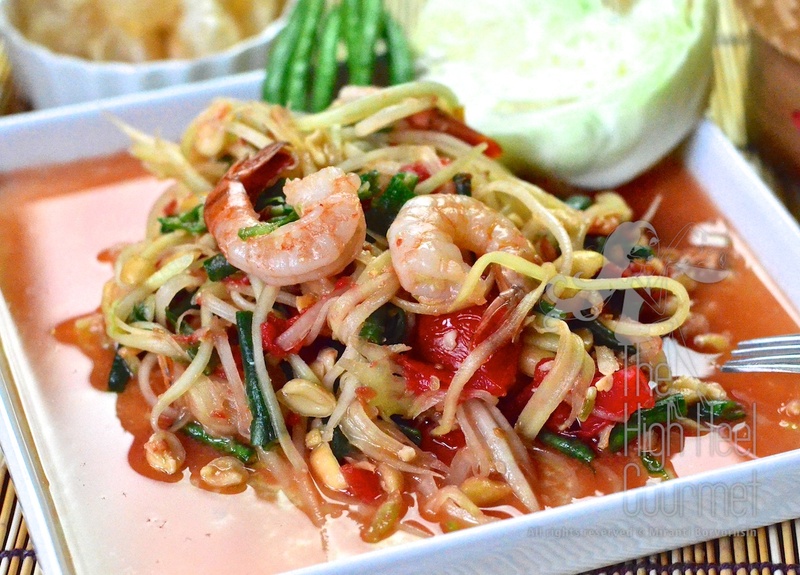 There is some type of protein in the Som Tam too, which we will discuss later. 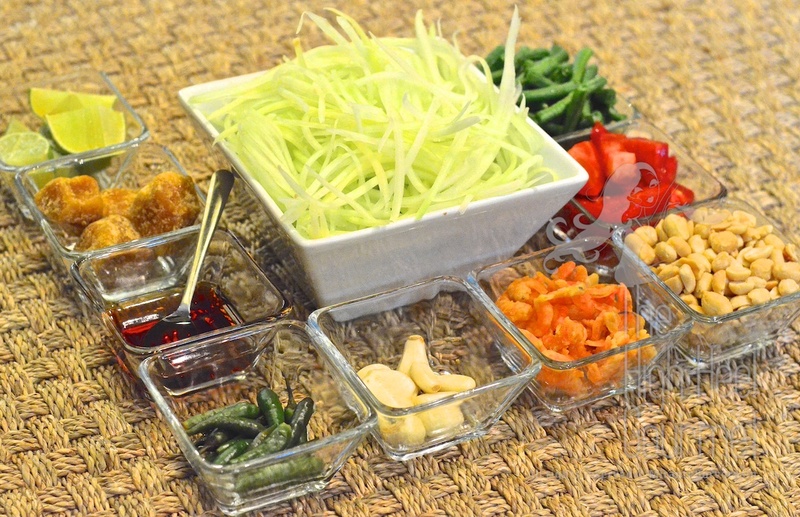 Som Tam is claimed to have originated in Laos, of where it was called Tam Som or Tam Mak Hoong. It’s still a discussion among Laotian, Vietnamese (called Goi Du Du) and Cambodian (called Bok I’hong) about who made Som Tam first. The Thais won’t even try to stake a claim with them, as we would rather spend time eating Som Tam and perfecting it and expanding it to many variations. I’ve seen some recipes on the internet. Several famous and not so famous chefs have attempted to make this dish. Oh my gosh, I was rolling on the floor laughing when I saw their recipes. They managed to get the dish to LOOK like Som Tam all right, but the taste…muahhahahaha…far from it, dude! Ok let’s trash their recipes for fun. It will also serve as an OH NO NO NO, YOU ARE NOT GOING TO DO THIS!! warning. A famous food magazine not only “halved crosswise” the Chinese long beans but also COOKED them…poor beans…got abused along with the garlic cloves that were supposed to be “minced”…hahaha…NO, I’m not done yet because they also put “CILANTRO” and “GREEN ONION” in the Som Tam. Well, I would kindly suggest that the editor should send the writer to a nearby Thai restaurant and ask them to make the dish for her to see. So, she doesn’t have to guess and make herself a laughing stock and also drag the editor into the pool. If the editor can’t find any native Southeast Asian writer to create the recipe for this dish, research more, dear. This is really discrediting to the magazine. Next, a famous chef “julienned” the green papaya, mixed lemon juice with the lime juice (What’s for?…Hello, we don’t grow lemons in the region, dude!) This ignorant master chef not only added “RED PEPPER FLAKES” and “ROUGHLY CHOPPED CILANTRO LEAVES” to his Som Tam, but he also “COOKED THE STRING BEANS” too…Adding cilantro doesn’t make the dish any “Thai-er”, you know (but he obviously doesn’t). He probably visited Thailand but never paid attention to HOW this dish was made. Go back to your restaurant empire–the steak, the grill, whatever your flaying, or even your TV show, slap your “universal sauce” on any meat, and continue to over-charge for the meal–and leave the Som Tam alone, would be my recommendation! These are the examples of ignorant people trying to show off the sawdust in between their ears, but the readers of my blog won’t be deceived. First of all, let’s look at what the Thai name means. Som=sour taste, and Tam=mush, something usually done by using a mortar and pestle. 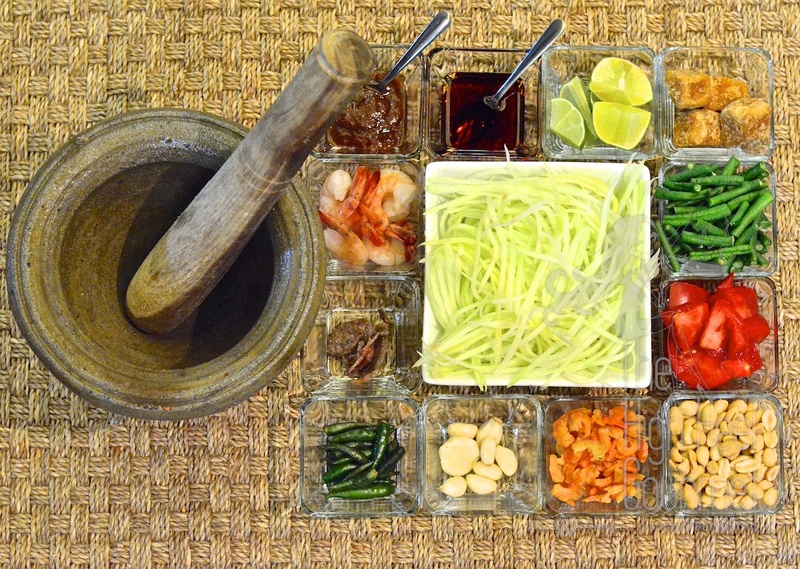 Can you start to guess how the REAL Som Tam is made? I learned how to make Som Tam from my nanny who came from Mahasarakham, a Thai province in Northeastern Thailand. It’s probably one of the very first dishes I made by myself because it doesn’t involve any fire to cook any of the ingredients. I’m sure I made my first “krog”, (which literally means “mortar”, that’s how Thai people call a unit or serving of Som Tam in Thailand) before I even turned ten. 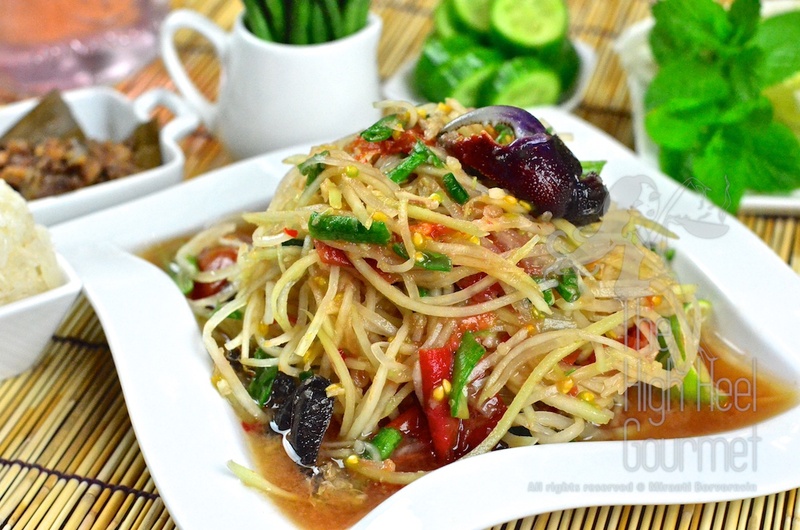 There are several different types of Som Tam in Thailand these days. 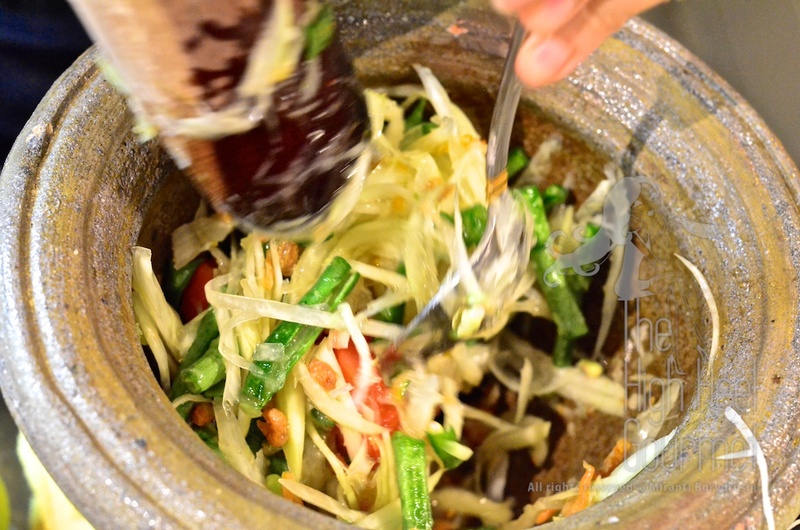 There used to be only Tam Thai, (or Som Tam Thai), which is sweeter, less spicy and contains a lot of optional stuff, and Tam Pu, (or Som Tam Pu Khem), which contains only the basic ingredients. These days Som Tam has many more variations. Let me give you the basic one first and we will discuss the varieties later. 1.1) Peel off the green skin and wash.
1.2) Hold the papaya in your hand. If you are a righty, hold it with your left and hold the knife in your right. Do the opposite for a lefty. 1.3) Chop the papaya lengthwise. Don’t go too deep. This is a reverse julienne. You cut lengthwise first and slice later. Chop repeatedly in an area about 2” wide. 1.4) Slice right underneath the lengthwise cuts you just made about 1/4” thick. The papaya should comes out in strands, just like you julienned it, but shouldn’t be all perfectly equal. I will tell you why later. Keep reading! 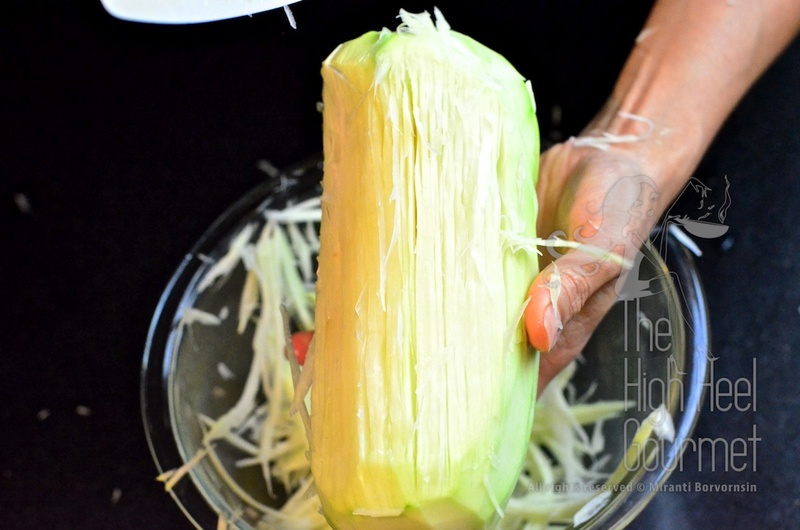 1.5) Chop some more and slice some more until you get enough green papaya shredded. I approximate about full one cup for each person. This is my favorite prep method. The papaya strands come out uneven and that creates the texture of Som Tam that I like. We will mush these papaya later with a mortar and pestle so the thin strands will get soft while the thicker strands stay crunchy because the pestle can’t soften them as much. There are other methods. You could use a cheese shredder (with bigger holes, at least 1/4”-3/8” wide, not the tiny ones) or a julienne peeler, to shred the papaya. Another way is to buy pre-shredded papaya from the Asian market. I don’t like this as much, since the strands are usually all cut equal in size and not as crunchy, but I use this method when I don’t have a lot of time. 2) Cut the long beans to 1” – 2” length, discarding the ends. You need about a handful in each “krog”. 3) Slice the tomatoes in half, or quarter them if you use a big tomatoes. 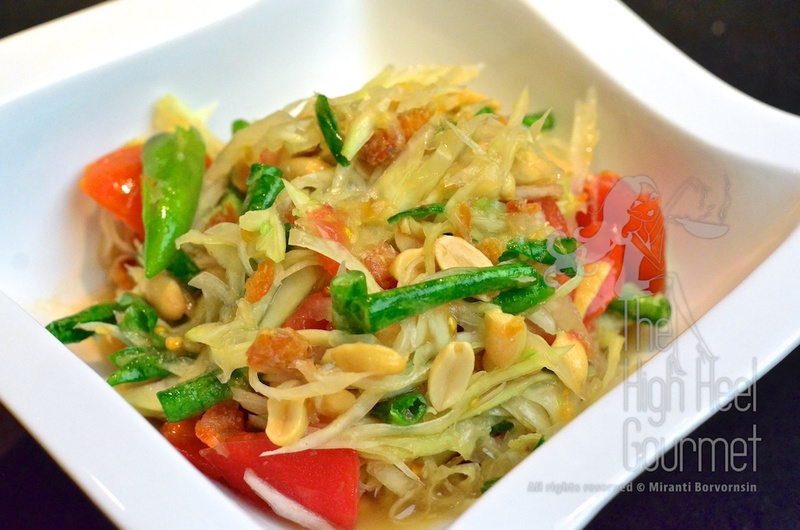 Som Tam Thai: This has the basic ingredients + roasted peanuts + palm sugar + dried shrimp. The super fancy Som Tam Thai these days also has fresh shrimp, too. This one won the popular vote among the fa-rang and the city people both, and also is the one mentioned in CNN World’s 50 best foods. Som Tam Pu: This is the basic + brined black crabs and sometimes palm sugar. 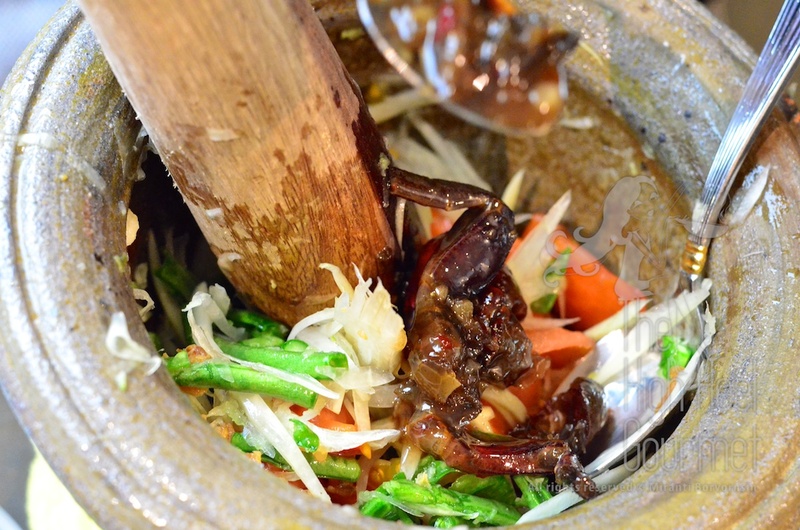 Pu=crab, so if you see “pu” or “poo” in any Thai dish’s name, or Thai people’s nickname, don’t be alarmed. No scatology is involved. Som Tam Pu Pla Ra: The basic + brined crabs (pu)+ pickled fermented fish (pla ra). This was considered Issan fancy Som Tam by my nanny. She said in her home town she could only put one thing or the other, not both. She also thought Bangkok Som Tam (Som Tam Thai) was too elaborate. Som Tam Lao: It’s the basic, minus tomatoes, + the fermented fish (Pla Ra). This is the original one that my nanny taught me, but these days it is the basic + Makok and maybe + Thai eggplant, quite fancy! I’m exhausted–so many varieties! When did this simple dish turn so fancy? 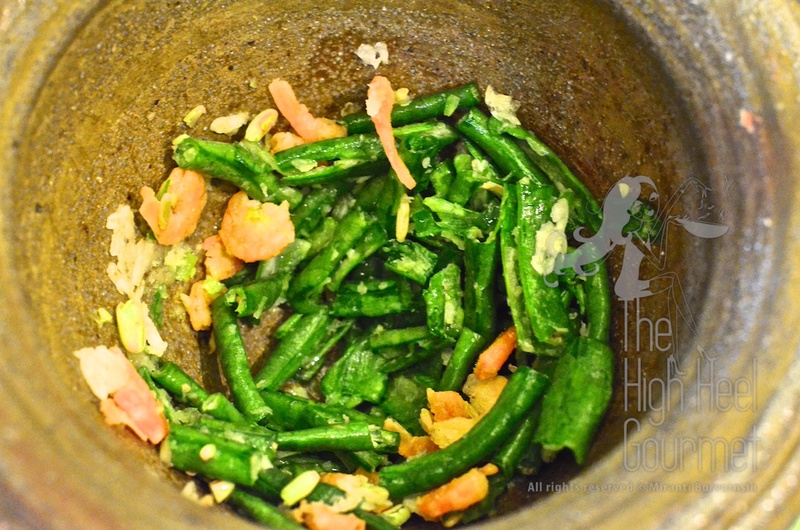 Oh…and I hope you know that there are fresh bird’s eye chilies or Thai chilies (lots of them) in EVERY Som Tam, right? 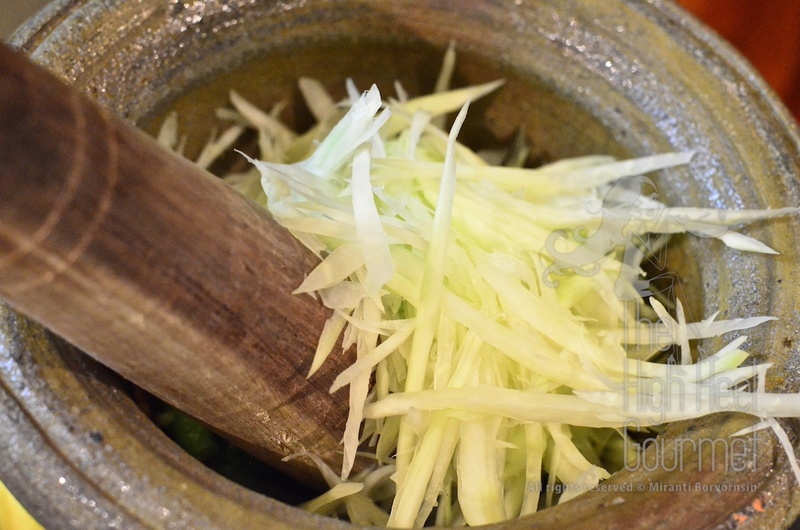 Before we start, you need to have a mortar and pestle. Which kind? The clay or terracotta mortar with wooden pestle is the best, but if you already have a stone mortar, you can use that. Just remember, if you are going to use a stone mortar, do not pound so hard on your green papaya or it will be too soft. LEFT: The granite mortar good for curry paste. 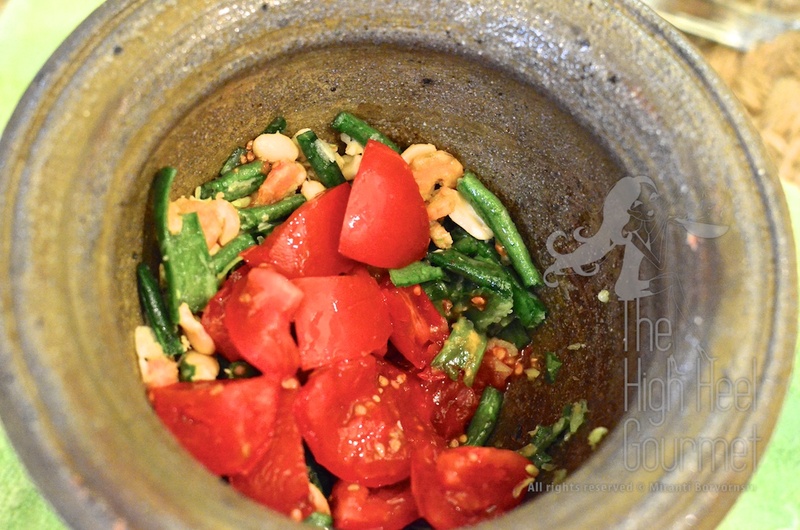 You can use it for Som Tam too but don’t pound the vegetables too hard. 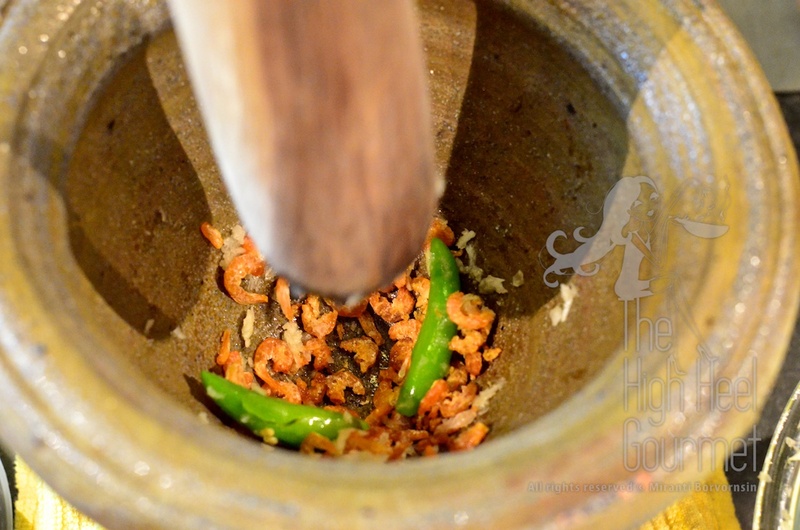 RIGHT: The terra-cotta mortar with wooden pestle not very good for curry paste because the pestle is too light to mush all the ingredients to a paste but the best for Som Tam. The veggies wouldn’t be so bruised. 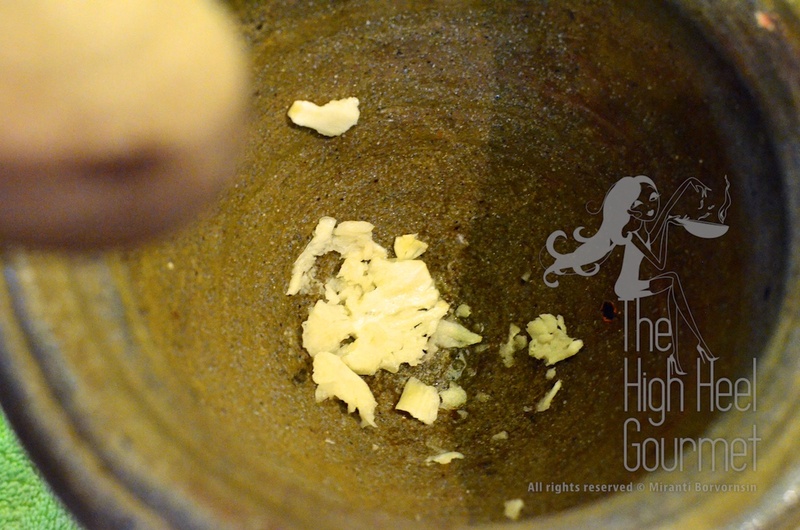 4) Put peeled garlic cloves in the mortar and mush them with the pestle. (That’s minced garlic, people, so squish them well…ROFLMAO) If you want it really spicy, add the chili now and pound it really hard. 5) Add dried shrimp and pound on them until they break into smaller pieces. 7) Tomatoes are going to get the abuse this time, but don’t pound on them too hard…oops…too late! They already splattered in your face, didn’t they? I used about 1/4 cup of cut tomatoes, but you may adjust it to your liking. 8) Squeeze the limes (no lemons), add the palm sugar and use your pestle to mix the palm sugar into the juice from the tomatoes and limes. I used the whole lime, but my lime was small. I approximate about 2 tablespoons of juice and one teaspoon of palm sugar. 9) Add a handful of shredded papaya (may be 3/4 cup, saving 1/4 cup to add later) and fish sauce. I can’t tell you how much fish sauce; you have to taste it. Approximately 2 tablespoons, I think. Look at the picture. I use a spoon to dig the stuff out of the bottom of the mortar and flip it to the top, pound on it a bit and dig again. I continue to do the dig and pound, dig and pound until everything is mixed well. 11) Adjust the taste to your preference. Then you add the rest of the papaya (the 1/4 cup that you saved). Pound on it and mix it a little more. Why don’t I add all the papaya at first? I like texture. I want my variety of crunchiness in the papaya, some soft and some crunchy. If you want some chili flavor but don’t want your Som Tam too hot, this is the time you add the chili pod and crack it lightly. Don’t let any cilantro or green onion get near the mortar or I will throw the pestle at you. Add the salted crab to the mortar after you add papaya. Crack the crab so the salted juice comes out and mixes with all other ingredients. Add the salted eggs last and taste it again to see if you need to add more lime juice or sugar. I’ve been living in the US a long time, since way back when farang were still calling this spicy green papaya salad they ate in Thailand “Papaya Pok Pok”. So, in the bad old days, I had a hard time getting ingredients here. What did I do? Green beans or haricot vert were substituted for Chinese long beans. 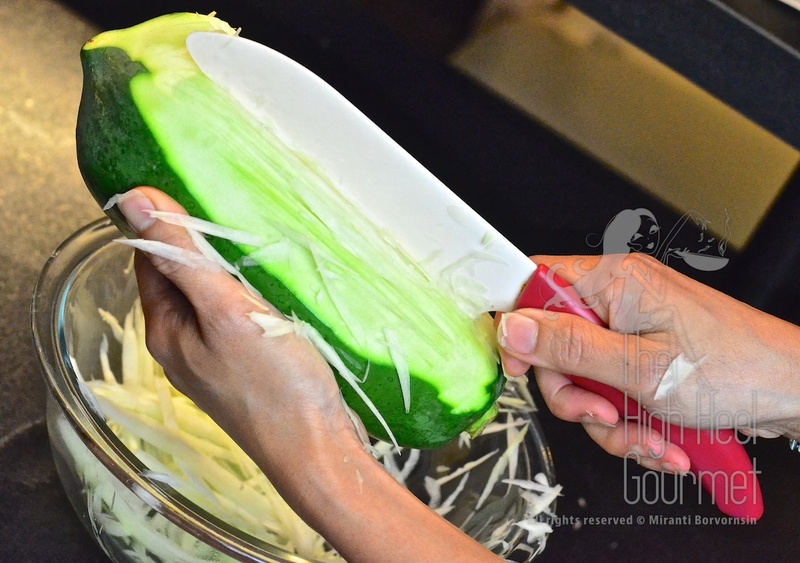 Green papaya was replaced with green beans, cucumber, carrots, spaghetti squash, jicama, chayote or broccoli stems. Indian jaggery sugar or brown sugar was substituted for palm sugar. And for vegetarians, soy sauce can substitute for fish sauce. 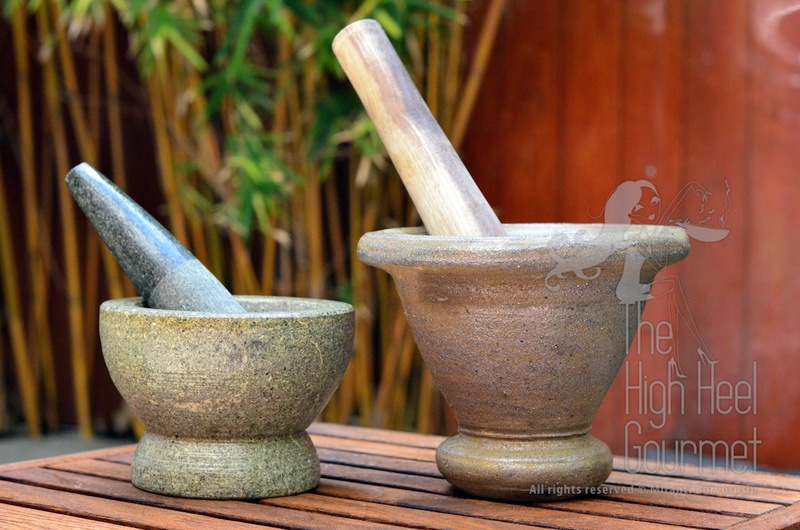 BTW, you can buy a mortar and pestle online or at Asian grocery stores. They’re inexpensive. templeofthai.com has them in 3 different sizes. The small ones cost less than $20. culinarysupplies.org also carries them in many sizes. Now you know the basics, so if you want to be creative with your Som Tam, go right ahead, as long as you don’t add cilantro and green or regular onion, you should be able to call it Som Tam. If it doesn’t fit the catagory, just change the name to Yum or salad and you won’t piss the Thais off so much! I got creative with my “Som Tam Khao Pode” here. I replaced the green papaya with corn kernels. 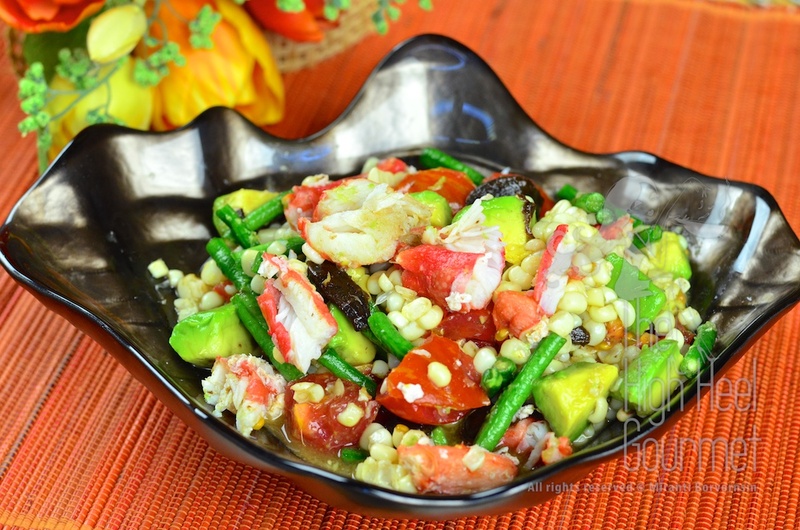 I added avocado, and my “pu” is Alaskan king crab! I called it “Horadee California Som Tam” (Horadee=South West). This entry was posted in Clicking in the Kitchen, Comfort Food, Dinner, Gluten Free, Lunch, Raw, Salad, Snack, Thai, Vegetable and tagged Asian, Cooking, Egg, Food, gluten free, Papaya, Papaya Pok Pok, Recipe, Salad, Salted black crab, shrimp, Som Tam, Spicy, Thai food. Bookmark the permalink. Hi! I love this recipe and make it often. Do you think this could be made with a spiralizer? I’m thinking of ordering the kitchen aid spiralizer attachment and I saw that one set does come with a thin blade. You should try. As long as you can get the shredded, they’re all good. I’m using apple, carrots, chayote, celery root, etc. to substitute the Papaya here in Switzerland. Try them. They’re delicious too. This is great! When adding the eggplant to this, do I steam pieces and add it in the end? Sorry if I am way off! No. Don’t you want your eggplants crispy? You flash fry them and add the fried one to the sauce and just toss quickly, very quickly, may be just shake the pan a few times. That’s it. O of course! That will be so much better! Thank you for explaining so well. The pictures look great also. I did have a question, I can not find the green papaya and was thinking of substituting spaghetti squash, but do i use it raw like the papaya? Or do i need to cook it then let it shred as normal. I am worried the mortar and pestle will mush the cooked into goo but I wasn’t sure if it needed to be. Thank you for your time. 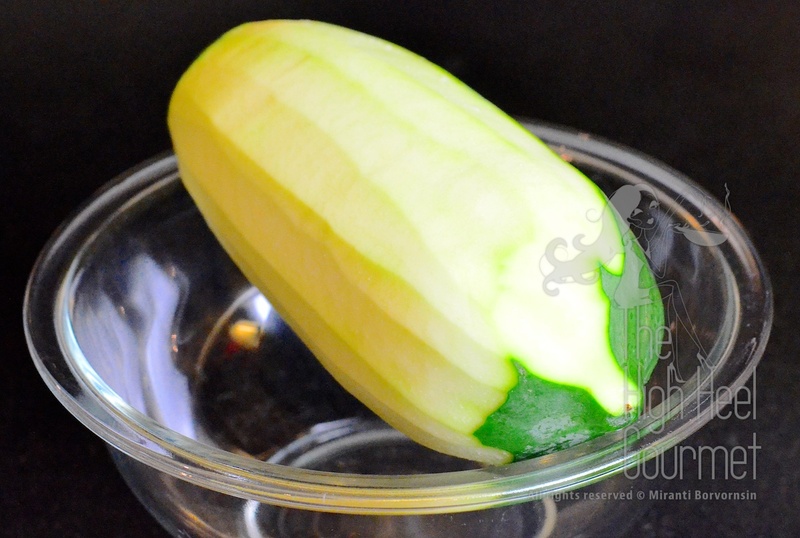 With spaghetti squash you can use them slightly cooked. So, you can shredded them easier but just toss them with the dressing. Do not mush them in mortar but you can mush the other things in the mortar before you toss them with the squash. I made it yesterday, it was amazing! Thank you for the help! this reminds me of my trip when i Went to Krabi last April.. 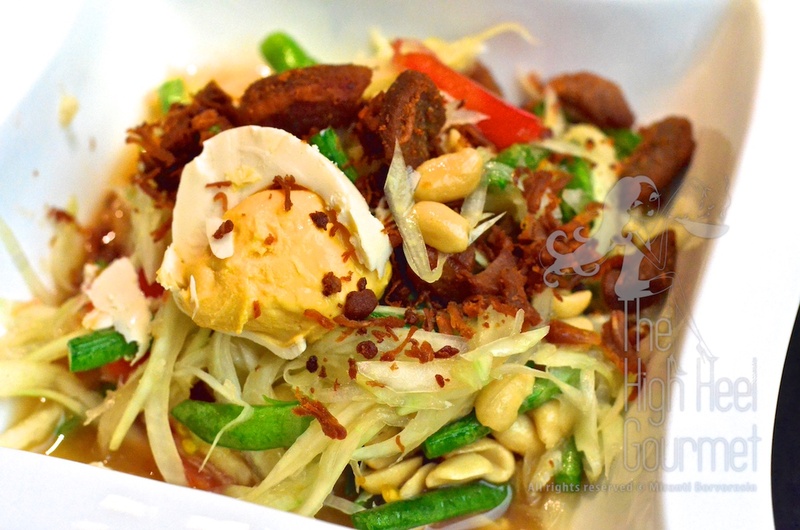 I love your salad.the papaya salad looking so good…..thanks for sharing…. I was always wondering how to thinly slice papayas! This looks so great and I love the idea of food that tastes big being good diet food. Thanks, I’m going out to get a mortar. I was just thinking about making this the other day, can’t wait to try your recipe! Looks delicious! Cool! How did it turned out? 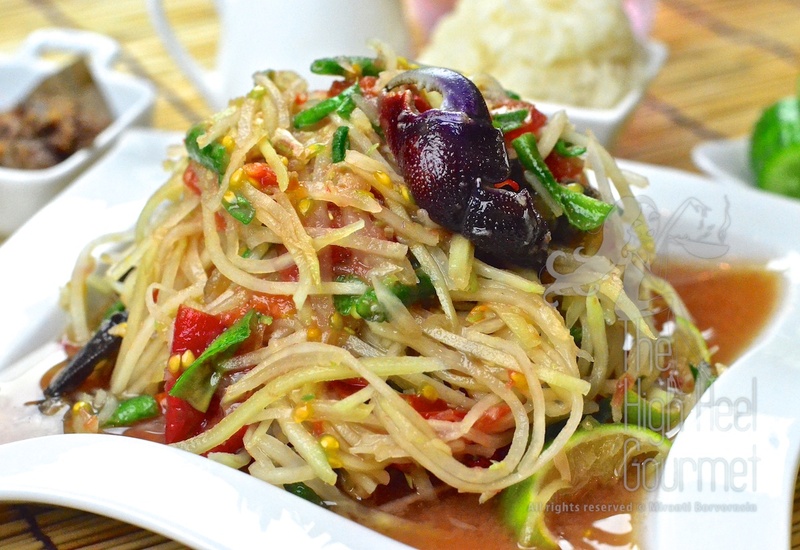 LOVE green papaya salad and your looks fabulous! Oh my, my mouth is watering! looks delicious. Greeting! Beautiful – and I don’t need to say it – amazingly authentic. I like carrots or spaghetti squash the most. You can use cheese greater to shred the carrots. 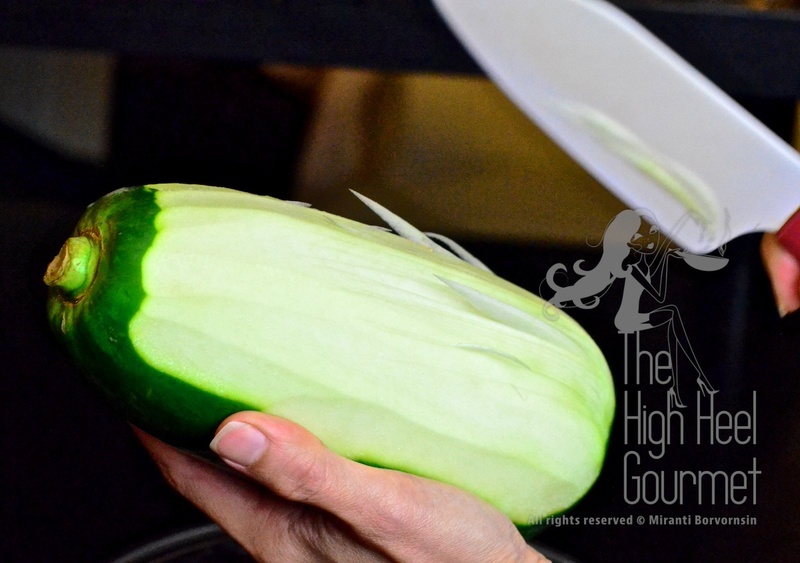 Spaghetti squash you can cut it in half not lengthwise but cut to separate top and bottom. Then use your fork drag along the inside around the circumference, then you get the strand just like you shred it (isn’t that how the squash got its name). Spaghetti squash doesn’t need to be pounded that hard in the mortar as like green papaya or carrot. You can add them at the end and toss them lightly with spoon and pestle. Your dish looks authentically delicious! I caught the “flay” thing, look out! He just might show up at your door for a Som Tam throwdown! Try it…or traveling to Thailand then you get to try it for sure. lol…I wish I can do that, you know. It’s the truth about men claimed they can lose 5 lb. in the morning! I saw it happened. My friend weighed himself before and after and he lost 5 lb. just taking errrrrr…, then after he had a big hunk of burger that make all the girls so jealous! I have not yet post the Pamela salad. Mix the dressing, leave only, crushed peanuts, roasted coconut flake, Pamelo, and shrimps. Then toss every thing together. 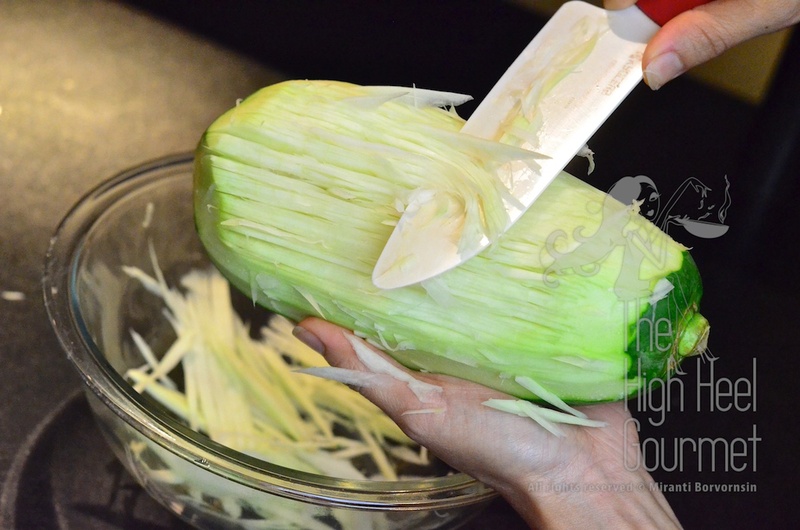 Excellent knife skills, great photos. Your posts seem to be telepathically linked to my ongoing Thai food adventures – last time you posted about Pad Kee Mao exactly as I had discovered it and now you post about Som Tam exactly as is becomes my newly found go-to diet dish. Down here in the south it seems to automatically come with pu and goong so I find myself ordering; som tam mai sai pu Mai sai goong…. which becomes a bit of a mouthful and I’m not even sure if its good Thai. It probably isn’t. The woman I usually go to is so afraid because of my specific orders that with each ingredient she shows me; Ao Mai? OK Mai? Offering a spoon up with the juices for me to check. You can imagine it makes it a lengthy process but oh-so worth it! I have to agree you can’t pass up on the garlic but WOW I have to make sure I have mints/mouth spray to hand to save my poor students from my potent post-Som Tam breath! lol…you got the language down! Yes, Som Tam pu, mai sai goong, mai sai pal ra, mai sai phrik that would be my order. Actually you can ask them to go light on garlic too. One of my friend don’t put garlic in at all but she put a ton of chilies but I put garlic and absolutely no chili! Isn’t it a great tasty dish for diet? I love it. I use cucumber to make the dish when I don’t have green papaya. Is this taste edible? I’m not in a hurry to lose weight but I have a little promise to my taste buds and my stomach to keep which is not to gross them out though. I pissed them off enough by drinking vegetable and fruit juice that my doctor insisted that it’s good for my stomach but mannnn…It’s not that easy to drink. Wow! This looks great! I never knew about the “reverse julienne” with the papaya! I’ve got to try that. Thanks 🙂 The pictures are great too! What camera do you use? Do you use a lightbox? Thanks…I used Nikon D7000 with just a normal Nikkor lens 55 f/1.4. I only used light box when I take picture at night. Most of the picture, step by step pic normally taken without light box. Sometime when I do close up, instead of switching the lens from normal to macro, I used Lumix GX1 with Leica macro lens but the picture’s color normally don’t come out as good as the D7000. I love som tam. My brother makes a good version. Very similar to yours :). Nice 🙂 I actually like it more when I don’t have to make it myself. I think tasting it a few time before I get it the way I want kinda take away the enjoyment…You are lucky! Miranti, this looks absolutely beautiful. I love your photography in your blog, it is always professional. Tell me, where do you find the little containers that you use to put your condiments in? They look fantastic, I am sure we would have something similar here in NZ! This dish reminds me of the times that I spent in Pattaya and the fresh seafood that I ate. I love Thai food at the best of times and this is one I would love to create one day. I must confess though my knife handling skills are not as good as yours, you are a real pro I must say! It’s just a little cup for panna cotta that I’ve found at a discount store (Ross) in the US. If you afraid of the knife, use the shredder or cheese greater instead of knife or better, go buy the pre-shredded one. I hope you have them there in NZ. I was trained to be a photographer way back in college so taking pictures is not that hard for me at all but the cooking…lol…I don’t know. Do I appear as a pro already?…heeheehee. I have never cook in commercial kitchen yet. Your photography is as beautiful as your food… I think its the way that you do your food styling that appeals to me. I think you are right I may be best to use a cheese grater to make this. I would like to get a proper shredder one day…. ;-) I wish you were here in NZ so I watch how you make your food. In Thailand, (I have been there 4 times now) they had excellent little condiment pots for their sweet, sour, and salty sauces/pickles/etc…) When I go again, I will have to check out their department stores a bit more for them. Thanks…I wish I get to your side of the world sometime soon too. I’ve heard it beautiful over there. I have Thai friends in NZ and they can find Thai ingredients easily. One of the friend said she was looking for one vegetable all over the Asian market there and couldn’t find them. Finally after 3-4 years she ended up asking the Chinese store owner about the vegetable (Ong Choy or water spinach). The store owner said, no one buying them because they’re all grows them in the back yard…lol… Let me know if you can’t find the ingredients, I can ask them for you. My college roommate used to make this for me! Now I make it myself, the proper way, of course. No cilantro or green onion! The only thing I do that you might take exception to is the way I shred the papaya. I use a mandolin shredder. My roommate, btw, used some kind of a handheld scraper. 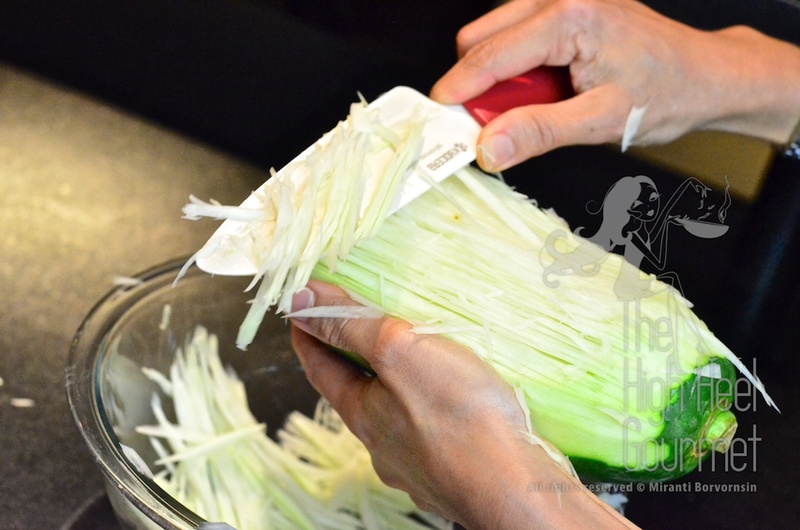 Sometimes she also bought green papaya already shredded from the market (we lived in LA then). Oh, this brings back so many memories! It’s ok to use the mandolin shredder or pre-shredded papaya. I used that myself sometime but I love the smell of fresh papaya so much so I do it tradition way. The handheld scraper is the “julienned peeler” I think. People use them in Thailand too. You can make this with squash if you have them in your garden.